I've been umming and ahhing over whether or not to show these on my blog before Christmas, but finally I decided that it is safe. 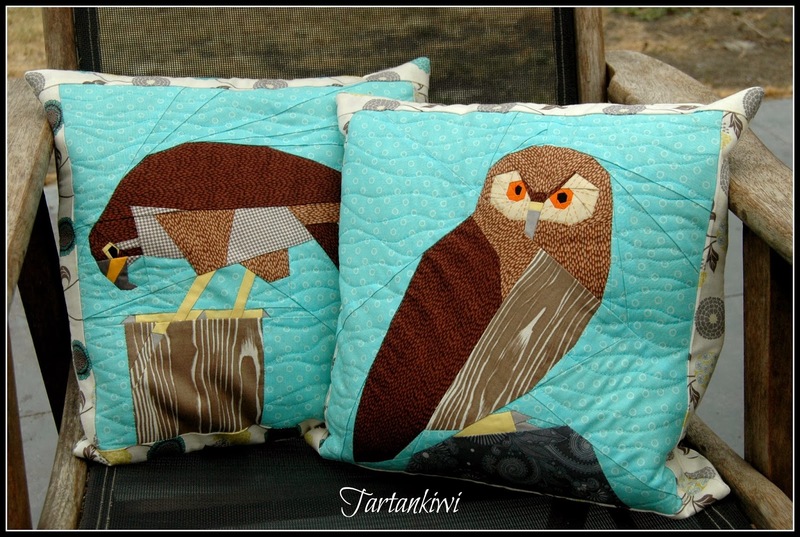 The chances of my Mother-in-Law or Father-in-Law reading my blog are next to nothing, so I thought I'd show the pair of cushions that I made for them. My Father-in-Law is a lover of birds, especially birds of prey, so my husband asked that I use my New Zealand Falcon pattern for him. We both felt that a Morepork for my Mother-in-Law would complete the pair beautifully. I chose fabrics that I thought would go with the interior of my Mother in Law's house, but I also tried to use fabrics that would give the birds texture. I wasn't too fussed about being correct to the colourings of the different species of birds- lets call it artistic license shall we! In the interests of getting these finished, I opted to stitch the ditch around the birds and then use simple wavy line quilting using my walking foot in the background. It worked remarkably well. I would definitely do this again if I need a quick finish. I just realised that I forgot to take any photos of the back of the cushions, but I added simple covered zips using Chrissie's tutorial. 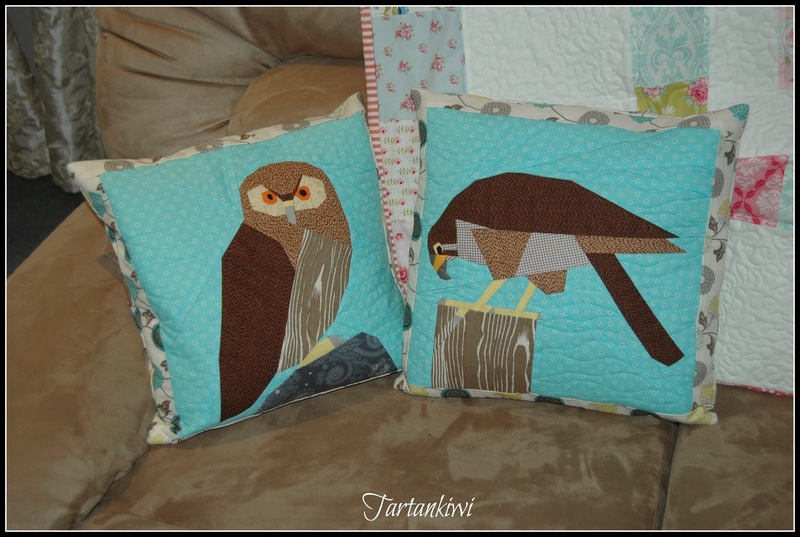 Your cushions look awesome!! I am sure they will love them. I bet they love them! Personalised gifts always go down well. Both your cushions are just gorgeous! I'm sure they will be very well received!! Oh my goodness - they're fabulous! Thank so much for linking up with the blog hop! So stunning! I'm sure they will be gratefully received! They are lovely and I hope they are appreciated and well used. I love your paper pieced work - these bird in particular have a real 'movement'. How could they not love them!